Each summer, DaimlerChrysler hosts about 100 automotive journalists for their "What's New" program. 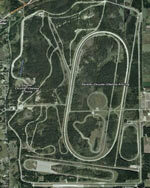 The event is held at their very secure Chelsea Proving Grounds in Michigan. Built in 1954 and covering 3,800 acres, the area is home to 95 miles of durability roads, high speed ovals and specialized test tracks, as well as emissions labs, chassis dynamometers, cold and hot rooms, impact testing, a wind tunnel and plenty of other super secret stuff. Oh, and of course, an off-road testing section. The day at Chelsea is one of my favorites each year. Not only do I get to crawl under the latest trucks and SUVs from Jeep, Dodge and Chrysler but I also get to drive just about anything in the DaimlerChrysler family out on the oval and the handling course. To those who know me, I'm also a car nut, so I usually end up spending some time in the go-fast stuff the SRT gang has as soon as I've covered what I need to in truckland. This year, the most appropriate stuff for this site all came from Jeep gang. 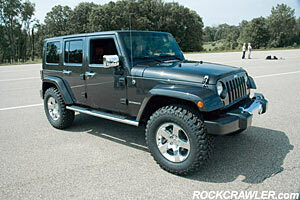 Upon my arrival at Chelsea, I made a bee-line to the Jeep JT, which made big waves in Moab this past Easter. While not a true concept, the JT is the product of the SkunkWerks team at DCX. SkunkWerks is a sort of unofficial but still kind of sort of official group of nuts that build vehicles on the side. They don't necessarily always get the budgets of the concept car teams or the glitz and glamour, but it's my opinion that they probably have a lot more fun and freedom since they are sort of underground. 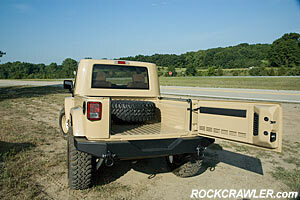 The JT body and pickup bed floor are based on the two door Egyptian military J8 version of the current JK Wranglers, while the chassis is a US Unlimited model. 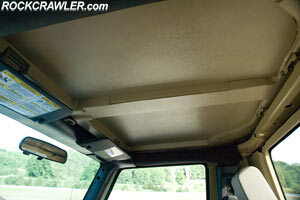 The bulkhead (front wall of the bed/back wall of cab) was borrowed from the Dakota pickup and the hard top is a chopped up JK top. 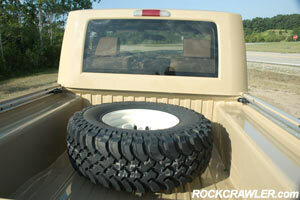 The bed holds a full-size spare tire and retains a modified JK tailgate, which still swings out to the side - sorry, no tailgate parties with this one. There are also rails on each side for tying down cargo. Inside the JK everything is pretty much stock Rubicon Unlimited, as is the whole driveline - 3.8L V-6, four-speed automatic transmission, NV241 Rock-Trac transfer case and Dana 44s with lockers. Up front, the JT has an AEV heat induction hood and winch mount, holding a Ramsey 9500 UT winch and underneath, a Superlift/Black Diamond 3" suspension lift helps clear BFG 35 x 12.50 R 17 Mud Terrains on custom Stockton wheels. 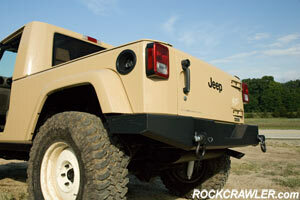 In the rear is a MOPAR bumper with d-rings. 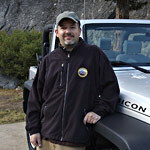 I met up with Jeep engineer and SkunkWerks member, Keith Montone, early in the morning for a ride on the off-road course. Climbing up into the JT is nothing unusual and since the interior is all JK, getting situated and driving was nothing new. What is new, is the close feeling of the back glass right behind your head and the lack of anywhere to stuff a camera bag! The cab is very tight - moreso than most single cab pickup trucks, where you can at least shove a few things behind the seats. There's basically no room behind the seats of the JT so if you actually had one of these babies, you'd be packing light up front. Driving the JT is not much different than driving an Unlimited, though higher and you can actually see out the back and over your shoulders. Off-road, it's not much different, either, though the ride height, clearance and trail performance are better, due to the lift. The truck is very well screwed together for the most part, for a quickie one-off. The roof squeeks a lot as you go down the road and trail from being cobbled together, but otherwise, it's as rock solid as any JK. What's the point of the JT? Like many of the projects at DaimlerChrysler, be they SkunkWerks or official concepts, they are done to gauge public interest. What sets the SkunkWerks team apart, though, is that they get to actually drive their vehicles around, get them dirty and pound on them - especially the Jeep guys! So while they are out pounding on the JT, they are showing it off to anyone who's there to see it. 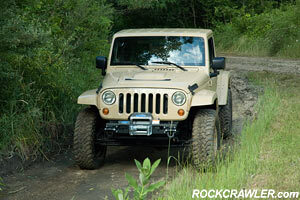 It was a huge hit at Easter Jeep Safari and at the proving grounds, it was all the rage. During our dinner the night before the program and all day at the proving grounds, several DCX executives came to me and asked me what I thought of the JT. My hands in prayer position, each time, I begged "please please please build it..." While each one coyly smiled, I also tossed in an additional request - "...with a diesel." This also provoked a big smile and knowing head nod. 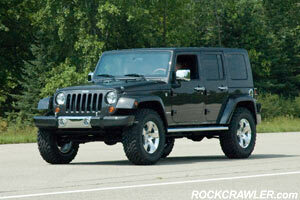 So the feeling I got was that Jeep is seriously considering something like the JT. The Gladiator concept from a couple years ago garnered great support, but not enough to make the business case. With the JT being so closely related to production vehicles, it wouldn't take a whole lot to build them. The biggest challenges would be buttoning everything up properly (fit, finish, noises, etc. ), feasibility of changes to production, bean counter blessings, and of course, safety. The basics are there so now it's up to the public to make their voices heard and for the Jeep guys to beg, beg and beg some more internally. The feeling I got from the execs was that the JT is very doable. With the shrinking mini truck market, the JT could have a niche all to itself, as nothing out there even remotely comes close to its all-around utility. Don't forget to say your prayers. 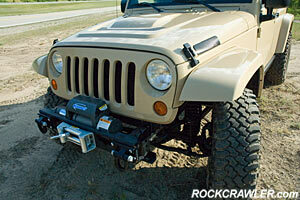 While the JT is the brawny JK, the Ultimate is the blingy brother. Also sitting on 35's and 3" of lift, the Ultimate coddles you in leather and plenty of shiny stuff, like rocker guards, bumpers, hood hold-downs, door handles, gas tank filler door, mirrors, tail light guards, and 18" wheels. 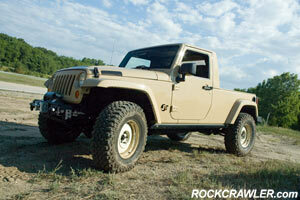 We didn't get a chance to drive it but functionally, it's a lifted JK Unlimited. Designed to show what the Unlimited can look like with a bunch of shine thrown at it, the Ultimate is quite the looker. All we can say is bring the bling! Michael Cohn is the founder and Editor of ROCKCRAWLER.com. Michael finds great pleasure in driving other peoples' vehicles. To volunteer yours, please contact Michael at comments@rockcrawler.com.